But it’s done now and it all worked out! It happened, it was gorgeous, I survived, there was no baby call during the wedding weekend and I even gained a brother out of the deal. On the flip side now, it’s all good. We are having a day of rest over here. I’m trying really hard not to think of the prep still needed for birthdays and babies on the horizon. I NEED A DAY PEOPLE. JUST ONE DAY. (I’m really screaming at my own brain here, that is desperately trying to get me to sit down and start the planning, ONE DAY BRAIN). Back to the wedding. I let my daughter woman my camera for the wedding. That was a first, I’ve never let the kids touch it. It was bought with an inheritance from my grandpa at a time when money was beyond tight and the likelihood of replacing it was slim to none. I’m not sure much has changed in that area, but she was being extra careful for once and I decided to let her go. 400+ pictures later and we’ve found a few gems. I’m impressed with Jena. I know the bride is a little blurry, but I love this picture of the happy couple. I’m looking forward to watching them grow together. I wish I could take credit for some of these! I love this shot of my mom. So rare to catch a real smile on camera. She got lots of my dad, 80% look like this. 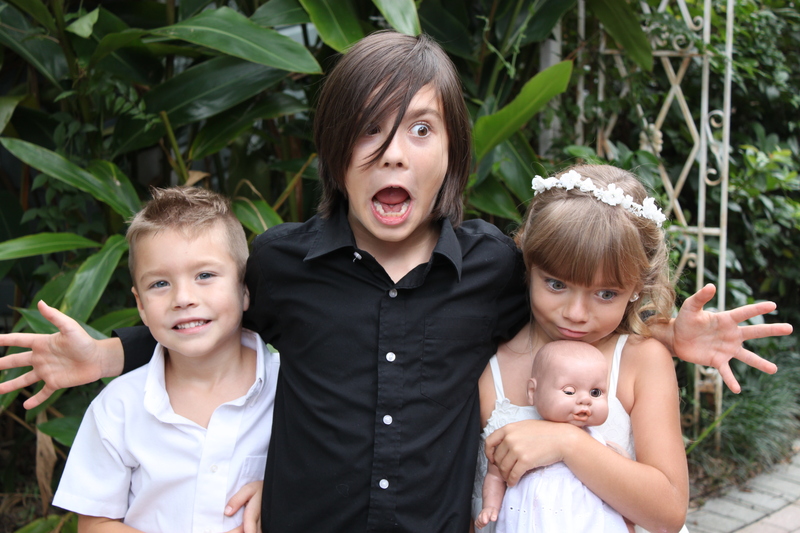 My mother wonders where Jena gets her goofy side. Wonder no more mom. Artsy shot she snuck of my hair. Love the way the pink came out. Finally convinced my little guy to dance with me at the end of the night. I think he mostly just wanted me to pick him up. The poor thing was so so tired. Also take a good look at the hair. I made it to the wedding without cutting it, but it’s about to be gone. Not all the little people were dead on their feet though. Jaron’s little nephew (son of one of the awesome bridesmaids) was a dancing fiend. This kid was seriously adorable. Speaking of adorable children. 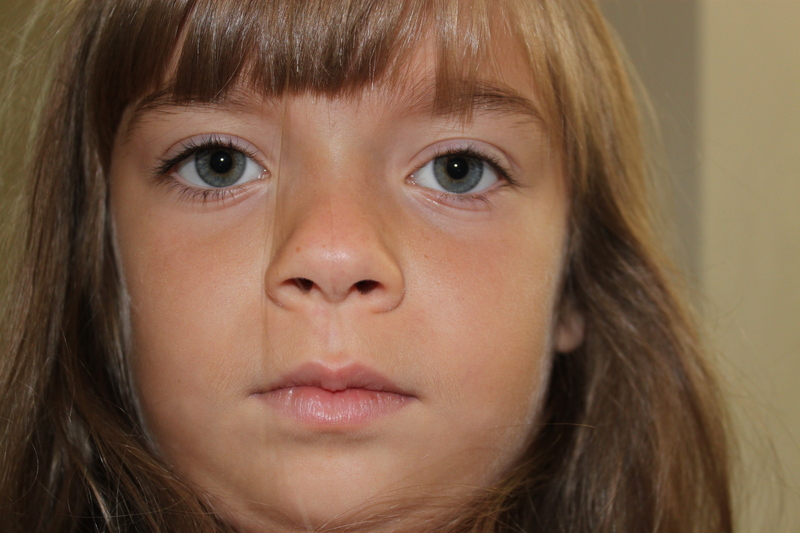 She obviously did not take this one. I do wish sometimes for shots where they are all smiling and looking at the camera. But this is my real life and I love my real life. I can appreciate photos like this for what they are. 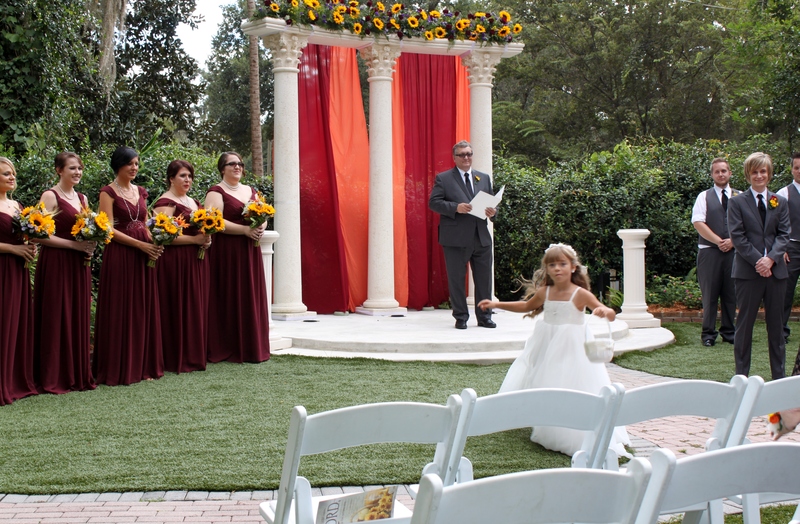 Here she is in her actual role as flower girl. She’d just finished her petal throwing and was fleeing the scene of the crime. She did eventually make her way back up to the front to sit, after I bit of running around. You can also see all of the lovely bridesmaids. I only knew one of them before this wedding, but they were a great group. Even though most of us were strangers, everyone banded together to do what needed to be done. They were a great crew. It was a beautiful wedding. Many congratulations to the bride and groom! Thank you to everyone that was praying for Brooklyn’s birth mom this past week. She has made her decision, and it was not us. We found out yesterday, ironically, right as I was finishing painting the baby dresser. We will continue to apply for grants and get ready over here. Hope for a chance at a baby moon. All the while hoping that our plans and prep get disrupted sooner than we expect. As we’d much rather have the baby than the plans. I have a life motto, if you will. 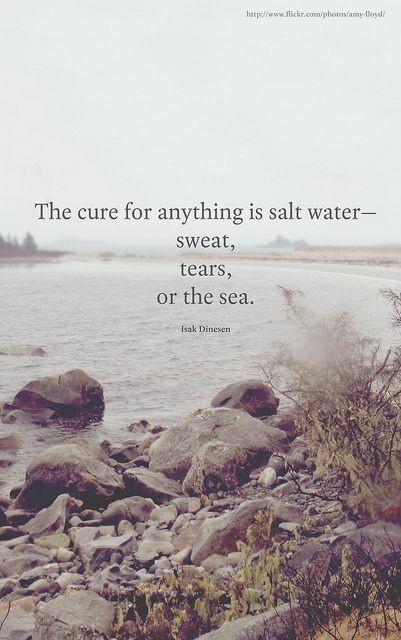 The cure for anything is salt water – sweat, tears or the sea. My attempt at the sea today has failed, but the other two are readily available. I did not get as excited about this attempt, however, the disappointment has been worse. I know another family is happy. I know our baby will come. I know the perfect timing is what I want. I know all the things I’m supposed to know right now. I don’t feel any of them today, but I also know that will come. In the meantime, I am very happy that my husband, who still occasionally drives me crazy, is at his best in the hard times. When I really need him, he far surpasses expectations. If anything I am grateful for another opportunity to see him in action. Hopefully good (for us) baby news. We’ve submitted again for another special circumstance. Deadline is tonight, we think books will be shown this week. There is a chance we will know by next week one way or the other. I’m cautiously hopeful. We don’t know much, but birth mom would like her to keep her name Brooklyn. So please pray for Brooklyn’s birth mom and family (if they’re involved, we don’t know) as she is looking through books this week. I’d like to ask you to pray that she picks us, but really just pray that she has supernatural wisdom and can see the real families through these books. It’s so hard to convey all of who you are without meeting a person. In related news we also found out we’ve been awarded a grant! Some of that work is paying off! We were super excited to get that letter in the mail, even earlier than we expected! I’ve adjusted the fundly goal down to reflect the new need, really wish I could make it reflect what has actually been provided so far. We are just barely under 6,000 dollars already between fundly, grants, and personal checks received. We are so grateful for you all! You can visit our fundly for updates or to give here! This was originally intended to be a very different kind of post. Under normal circumstances we don’t know if our profile is being viewed. It could have been shown 100 times already (not likely). We only find out if we’re picked. There are however, “special cases.” Sometimes they do not have the amount of books they’d like to show for a certain situation. Sometimes you requested being asked first about certain circumstances. These we get emails about. There’s been more of these than I’d expected. However, we didn’t feel any of them were ones we should submit for until last week. Last week’s email felt almost too good to be true. A little girl due to be born soon (all we knew was before September for sure) circumstances something we were totally ok with. I cannot begin to tell you how I excited I was. Just reading the email. Waiting around for hours for Bycemaster to get home. Then sending the email saying put us out there! Most of this process has seemed surreal. I know eventually there will be a baby. I know this. But there is so much waiting. In every step of the process. When you are waiting with no end in sight, it’s hard to believe the end is just around the corner. Even though it could be. But for us it was not this corner. I’ve been obsessively checking our email for days. This morning I got an email saying we weren’t chosen. We did not tell the kids about submitting at all. We knew what has happened was a very real possibility. So it’s a quietly mournful morning over here. Upon reflection here a few things we’ve gleaned from this waiting process so far. 1) Some days waiting is easy. You hear it’s hard. The waiting is so hard. It’s the hardest part. That’s all we’ve heard. But there are some days it is easy. Days go by and it’s not been agony. Then there are days like the past few where you know something is close, but you don’t even know when you will know anything. And then there’s todays. It’s hard. 2) You’re not as ready as you think you are. We’ve gotten so much stuff for Baby Girl Byce. We’ve washed and folded clothes, set up pack n plays, gotten car seats. Then OMG IT COULD BE TOMORROW! And you realize how unprepared you really are. We still need to set up a hospital plan for our current kids. I need to figure out what I’ll pack in our stay bags (what do you wear to something like this!?) I don’t have the Lact-Aid nursing system I’d already done research on, but never purchased. I haven’t even given any thoughts to what we want to give to the birth mother. So many more things. 3) Longer waits are better for grants. We’ve only gotten 1 grant application all the way to submission. The rest are in various stages of not done yet. But even the 1 that is in would not have mattered for this baby. The current one was a minimum of 90 days past deadline to even find out. And grants only pay out before placement, if you even get any. After placement, you’re pretty much screwed. I have renewed motivation to get the rest of the applications in ASAP. Any takers on references? We’re gonna need some more. 4) Things don’t always turn out like you thought. So this lesson has really been in process longer than just the waiting process. The whole adoption process from picking an agency to being in waiting has not been like I’d originally envisioned. But see I’ve been envisioning this since long before anything in my current life. I also never envisioned my current life. And my current life rocks. This process has morphed and changed so much from my preconceived notions. But there is peace it’s as it’s supposed to be. This is what it looks like for us, not me, us. That’s important and so much better. 5) Good people are gold. Bleeding off the last point. Life is not meant to be lived in isolation. What dreams I may have are not meant for ME, just me, all about me. We are all connected and the dreams we have are also meant for the people our lives intertwine with. We are are all in this together. I could write a whole post about this one. From the gifts to support to prayers you are all so important. Having people super excited with you at even the chance of a placement is gold. Having not a single person say well don’t get your hopes up, is gold. Knowing there are so many of you praying for us in this journey, is gold. You all are gold. I am sad and disappointed I’m not gonna lie. I’m also grateful I allowed myself to be excited that this could be it, it really could have been. Ups and downs are part of life. Someone who has been in waiting is super happy and excited this morning. This is a loss, but it is not a death. There’s a little balm in a loss that is someone else’s gain. Maybe next time it will be our gain. So yeah this adoption thing is rolling. Things are speeding up, I feel like I’ve added another part-time job lately. I have only read 1 fiction book this year, and for me, that’s huge. I had to cut myself off so I could get work done. We had our first home study visit this week, yay! It was the next day that I caved and allowed myself one actual good book, finished it last night and was back to work this morning. Made calls all morning and virtually no progress on the adoption. I got a lot of other bills and things paid and ran my head into a hundred dead ends on the adoption front. But things are still drawing to a close, I can actually see the end of our part in this process, I can taste it. 5 days till our second home study visit and then second week in February is the final visit. Assuming I can our homework packet done and wrap up the last to-dos from the home study visit in time, which I will, we will be making our profile book next month. That’s the last step for us. Once that’s done, we’re ‘in waiting’ and we sit around and wait for the call. And try to find the rest of the money. The biggest chunk is due with the baby. We can’t officially apply for most grants until the home-study is complete, but I’ve started a few applications anyway. They are long, and crazy, and after all we’ve already done, I will eat them for breakfast. So there’s that outlet and then there’s magic and miracles. Not to say those two things are the same, just saying I’d be happy for either of them to come through. Then there’s fundraising, I hear people say things like fund me and kickstarter and normally I’d be all like yes another thing to learn and research about! (yes I know I’m a nerd) But right now I’m more like please someone just tell me which one is supposed to be good for this thing. Anybody? What will work for an adoption fundraiser? Just tell me. Please, please, pretty please. So now that we are this close, I feel like I’m about to go into labor. I need to have everything ready! AND like I haven’t even gotten pregnant yet all at the same time. One minute I’m researching ways and equipment to re-lactate and the next I’m realizing I still haven’t shown Neil the list of potential names. Part of me wants to have everything prepared and the other part of me wonders how I’m going to handle it if I have EVERYTHING ready and the call still doesn’t come for months and months and months and months. I mean it is a real possibility, but so are the people we met at our training who didn’t even finish their profile book before they were matched or only waiting a few weeks or few months after being put into waiting. It also feels weird getting everything ready for a baby that could be a year or more away still, it makes me feel fake somehow. Like this is all a game of pretend and I’m not really an expecting mom because I’m not pregnant and I don’t know when. I really never realized what a head game this was all going to be.